Maggie Sullivan decides to take a leave and go visit her dad Sullen at Sullivan's Crossing. Sullen is the owner of a general store in rural Colorado. Maggie is escaping her troubles. She is a neurosurgeon down on her luck. Her practice had to close down due to both of her partners being under investigation for doing surgery on patients who didn't need it. Also, she's dealing with her own malpractice lawsuit after a teenager died while she was in surgery. Last but not least, her boyfriend broke up with her when he discovered she was human and she was too sad after her miscarriage. (Yes, the guy was a tool and worthless!). Cal Jones has been camping in Sulling's Crossing for a while. He's trying to restart his life after leaving his old one behind. When Maggie's dad has fallen ill, he decides to help around with whatever they need. While doing it, he also gets a chance to get to know Maggie and her heartache. He's in need of someone to help with his own loneliness. Their nights are good enough but can they both move forward? Both characters have lost so much. Poor Maggie was dealing with enough on her plate. She was a very devoted daughter after her dad was sick. She took care of him despite his temper tantrums. She also helped around the property and had enough time to take care of the sick or help a child in need. She had a good sense of humor but I think she was scared of where her life was going. In a way, she was hiding from her problems. For that matter, Cal was also hiding from his own issues. He was a hard worker and I believe he cared for Sullen and Maggie. I also think being with Maggie made him happier. I just didn't believe they had a great passion for each other. It was more like they were comfortable with each other and they didn't want to spend the rest of their lives alone. All in all, I enjoyed it and would read the next one in this series. Maggie is a neurosurgeon in need of a break. Her practice is closing due to her partner’s unethical practices and she is dealing with a lawsuit, a devastating break up, as well as a personal loss. Maggie packs up and decides she needs to head to her dad Sully’s campgrounds for a while to clear her head and figure out what she wants. Cal is hiking through California when he stumbles upon Sully’s. He decides to wait until it heats up to start. He begins helping around the grounds and can’t stay away from the beautiful, strong, Maggie. Maggie and Cal couldn’t be more different, but when they start to get to know each other, they realize they may have more in common than they expected. I have to start off by saying that it was SO hard for me to get into this story. About 100 pages in I still didn’t feel that need to keep turning pages as fast as I could, but when I got to page 130 or so I couldn’t put the book down. So my first piece of advise is to give this book a shot, keep at it because it’s truly an amazing story about love, loss and finding yourself all over again. Maggie was a fascinating character. Her education and profession aside, she was strong but still vulnerable and human. And Cal… Cal was such a complex man. He had a past that was devastating and holding him back from true happiness. Maggie and Cal really could relate in a lot of ways and helped mend the holes in each others hearts. 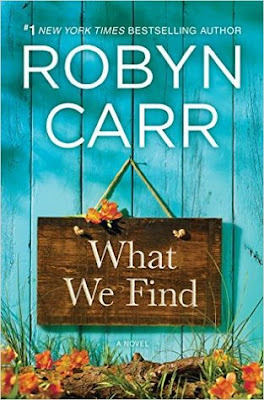 This is the first book I’ve read by Robyn Carr and it won’t be my last.